Princely flag of bundi The Hadoti region in which bundi stands takes is named for the Hada Rajputs, an offshoot of the Chauhan clan. The Hadas settled in the region in the 12th century and dominated the area for several centuries thereafter. bundi was conquered by them in 1241 and nearby Kota in 1264. 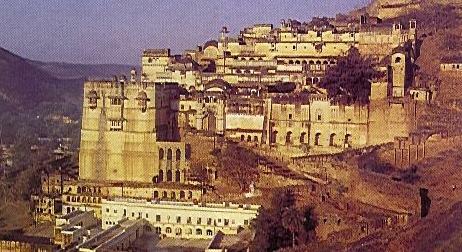 At one time, the Hada-ruled state of bundi encompassed the present-day districts of Baran, bundi, Kota, and Jhalawar. Over the next 200 years subsequent rulers formed a close alliance with the Sisodias of Mewar, intermarrying with and assisting them during times of war. One of the most notable rulers was Rao Rattan Singh (1607-31) who saw service during the reign of the Emperor Jahangir. When Mughal Prince Khurram rebelled against his father, and gained the support of 22 Rajput princes, Rattan Singh stayed loyal to Jahangir. He defeated Prince Khurram at the battle of Burhanpur during which two of his sons were badly wounded. As a reward for his service Jahangir gave Rattan Singh many honours. With his 14 year old son Madho Singh having proven himself during the suppression of the rebellion as a courageous warrior Rattan Singh carved out of bundi in 1580 sufficient land to create for Madho Singh the independent principality of Kota. Part of Kota was later used to create the separate Jhalawar state in 1838. Despite the loss of land to the new kingdom Rattan Singh retained sufficient territory and revenues to begin construction of the Garh palace.